Topic: “unsettling” pictures of women with guns??? Re: “unsettling” pictures of women with guns??? The issue is even finding a kitchen she could fit in. A couple of previous posts discussing the unbiased, master of terminal ballistics' findings. Where is that sarcasm button? Topic: Welcome your Questions, Concerns, and Curiosity. Re: Welcome your Questions, Concerns, and Curiosity. Looks like I'll be out your way at the end of the month blue. Mayhaps a shoot date? jmz5 wrote: I love H335 for 55gr .223, and Varget for 69gr and up. What's your .223 barrel twist, and distance you want to shoot? Second that. I love varget and H335. H335 sells out at the local place here as fast as it comes in though. Never a good idea to use pistol/shotgun powders in rifle cartridges. The burn rate is too fast. Rifle powders have a very slow rate of burn. Plus rifle cartridges are greedy and eat up powder fast. They don't like to share. Definitely kind of high for used. The spots you're seeing are actually brass and copper. It happens with a lot of guns, mostly rifles. I have brass spots all over the feed ramp of my FAL. Get some Kano Kroil and it will dissolve those in just a few minutes. That configuration was never offered to civilians. If you've got some really, really strong ties in military or LE then maybe you could get the hand guard. 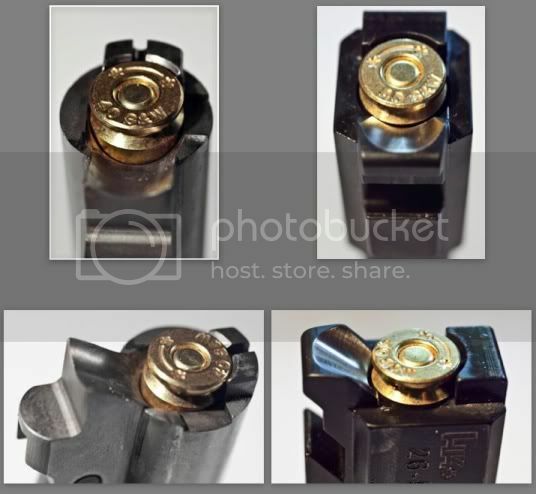 Glock barrels don't have fully supported chambers so shooting hot loaded, high pressure rounds in those is a dangerous act. Just check your chamber. That's about what the sears are going for on all the auction sights I've seen. The full rifles go for around $6500-7500. Check the classifieds site subguns. They are a good source of personal listings of nfa stuff. I will be working to get my tax refund done as fast as possible and if you still want to sell when I have it, I'll for sure take you up on it. Topic: Most lethal 223/5.56 ? Re: Most lethal 223/5.56 ? I've read 55gr fmj produce some pretty grievous wounds. They apparently fragment pretty violently at the right velocities and the US military stopped using them because of the potential to violate the Geneva convention. That's what I recall anyway. Topic: How ridiculous is this? I thought we were past this kind of stupidity. At least just filter the guns out if parental controls are set to. I use wd40 as my solvent then wipe it dry and lube with tetra oil. Sounds like you got quite lucky. Welcome.